How do I import my old comments? 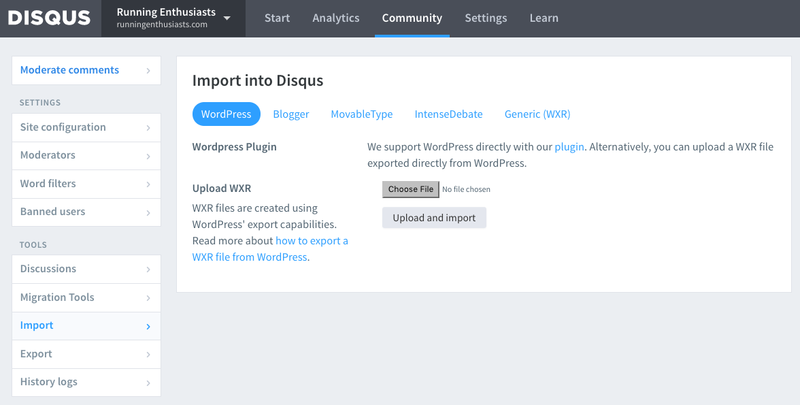 Users can import their old comments from the Disqus admin under the Tools > Import tab after registering. Users currently can import from WordPress, Livefyre, MovableType, and IntenseDebate, as well as certain versions of JS-Kit/Echo. For any other platforms, we suggest using our custom XML import format. Please note that associated Gravatars will not appear with imported guest comments. Once an import has been queued, it can take up to 24 hours to finish. If your import has finished errors, kindly see our general importing troubleshooting steps.